Hoover React hits the market promoting an interesting concept: it can distinguish between bare floors and carpeted areas by its own. Based on this feature, it can adjust the suction and the brushroll. I was talking about this idea some time ago and today I finally saw it implemented in a working appliance. All the 5 React models look nice and are well crafted. Overall, I admire the way Hoover reinvented itself and I appreciate their new additions. How could I not react to the new Hoover React? Hoover tries to reinvent itself in 2017 with a new line of uprights which seems to be striped directly from an Asimov novel. Their most interesting addition? Hoover React can sense which type of floor you vacuum and adjust the brushroll speed accordingly. If you’re interested in the company, you can check out the most important data here. Hoovers are no longer 100% made in US. Since 2007, Hoover is owned by the TTI, a Chinese conglomerate specializing in cleaning appliances among others. However, that didn’t stop me to review some their products before, here on VacuumsGuide.com. For instance, I was not impressed by their Hoover Air Cordless 3 years ago, but cheaper models such as the Hoover Air Steerable or floors scrubbers such as the Hoover Floormate Deluxe are reliable and efficient. The other models are very similar in terms of color and body design. A few essential features, however, sets them apart, as you’ll see bellow. Some of Hoover React’s specifications vary depending on the model, while others remain constant. The motor on most of these vacuum cleaners is the same. The only one which is slightly weaker is the one installed on the Powered Reach Lite version. The WindTunnel Surge technology is continuing the WindTunnel Hoover patented tradition. It basically means it can handle any type of dirt, grainy dust and or pet and human hair without problems, based on a large channel built in the nozzle. As for the suction, the producer doesn’t rate it in AW or CFM. I estimate it to deliver around 150-170 AW, which is decent for an upright. You can variate the suction using the suction control valve which is mounted ergonomically on the handle. This may come in handy if you need to get rid of the regular stickiness most upright display when vacuuming bare floors. The one thing I’d like to focus here is the FloorSense technology. You can choose to activate/deactivate this feature by pressing the black button mounted on top of the body or directly from the Hoover App. Speaking of the Hoover App, you can customize the experience of using the FloorSense tech by installing this app on your Android or IOS smartphone. The app can connect via Bluetooth directly to your Hoover device. Here you can set up i.e. whether the brushroll should still spin when in Hard Floor mode or not, see statistics or monitor usage levels of the filters. The FloorSense works well – it quickly detects which kind of surface one vacuums at a certain time. The output is displayed directly on the FloorSense LED dashboard, which shows you if it detects you’re vacuuming hard floors, carpets or if the brushroll gets jammed. Hoover React are corded products and thus don’t have internal batteries. They are powered directly from the 120V outlet, using a power cord. With a consumption of around 1300 Watts and an amperage of 11 amps (except for the Powered Reach Lite which has only 1100 Watts / 9 amps), they are pretty standard at this chapter. Hoover React cleaners have medium-sized dirt bin cup of either 0.4 gallons (the Professional Pet Plus version) or 0.26 oz (all the other versions). The bins are light, convenient to empty and clean, since they can be detached from the main case. I’d appreciated a bit more space, but the values listed above are still reasonable. Less watts and more power is what I’m looking after here, in this section. Hoover has made some great improvements on the filtration system. The new sealed filtration system eliminates allergy-causing dust that may get blown back while vacuuming. This line of vacuum cleaners has 2 layers of filtration. The first layer consists of a rinsable filter which is placed right on top of the bin. On the second layer, 2 HEPA-level filters capture around 99% of the allergens which can be as small as 0.5 microns. The Pet version even has a Carbon HEPA, which is a bit better than the rest of the standard filters. The secondary filters are not washable and should be replaced every once in a while. Dimensions 12.2" x 13.4" x 44.5" 10.8" x 12" x 44.1" 13" x 15" x 44" 11" x 13" x 44.5" 12" x 13" x 44"
Cleaning Path 12" 12" 13" 13" 13"
the Crevice tool – This attachment ensures that the cleaner reaches all the areas that are difficult to tackle like inside radiators, vents, baseboard, and corners. You can also use it to clean beneath your appliances and furniture. With the XL crevice tool, you can clean spaces up high like ceilings. There’s also the Deluxe crevice tool which has a blue rubber edge. The length of this attachment is different depending on the model but can be easily replaced with another one. the Dusting brush – It is made with long, round and soft bristles that you can use to whisk surfaces and areas such as framed art, lampshades, blinds as well as windowsills. With the Flexible dusting brush, you get an adjustable swivel point. And since it has natural bristles incorporated in it, you can use it to clean delicate surfaces. the Turbo tool – This type of tool is similar to motorized brush head (almost identical with Dyson’s Tagle-free pet brush). It has a compact size and rotating bristles that enables you to reach areas that you want thoroughly cleaned. With the Pet Turbo tool, you can remove stubborn pet hair from the floor and above the floor surfaces. the Upholstery tool – This attachment is specially designed to clean upholstery items. The Pet Upholstery tool enables you to clean surfaces of the upholstery items covered with pet hair (I really like this kind of definitions). the Baseboard duster and the Hard Floor duster – Dusters are also great attachments that you may want to have if you regularly clean baseboards and hard floors. Just as their names suggests, the baseboard dusters are meant for cleaning baseboards while hard floor dusters are designed to clean or brush hard surfaces and floors. the Accessory bag – These are good for keeping everything in one place. Hoover React vacuums can be used to clean almost every inch of your house. Provided the power cord can reach the section of the house you want to clean, be it stairs, ceiling corners or just the floor, you can depend on them to get the job done. The brush can be twerked a bit to improve usability depending on what is being needed at the time. Hoover React lift models feature a canister which can detach from the main case, just like a Lift-Away Shark, providing convenient above the floor cleaning. Maneuverability is very important when cleaning. The swivel steering ensures a good maneuverability. This may come in handy when cleaning tight spaces. The shape of the nozzle could be a bit improved to capitalize on the swivel steering tech, but all-in-all, I liked the way it moves. The the model which I’ve tested, the Professional Pet Plus, isn’t loud, nor quiet. Assembling the product takes just a couple of minutes. Installing and connecting the application is however a challenge for non-tech persons. Luckily, you don’t really need it to make it work. FloorSense Technology – As discussed, it uses some sensors to detect the type of floor you want to vacuum. This in turn automatically adjusts the speed of your brush roll, to optimize cleaning. Multi-Cyclonic Technology – The Hoover React cleaners come with built-in multi-cyclonic technology that ensures there is no loss of suction. Up to 5 cyclones filter the airflow, before the debris reaches the filters. Hoover App – With the growing popularity of smartphones, this might be appealing to some consumers. The app enables you to customize the cleaning and the maintenance settings. Unfortunately, it’s not that user friendly; it still needs some work. Hoover tested for paws and claws – If you have pets at your home, I’m sure you know how hard it is to clean after them. Luckily, with the React, you will effortlessly clean their hair fibers even when they are stuck on the floor. Hoover made sure of this in their special “paws and claws” tests. All Hoover React cleaners come with a 5-Year limited warranty. This is one of the largest warranties I’ve seen in a Hoover product. With the cheapest at around $200 (for the Hoover React QuickLift UH73300PC) and the most expensive at around $350 (for the Hoover React Powered Reach Premier UH73550PC), these vacuum cleaners a far from the usual price tag of a Hoover. However, one can occasionally get great discounts for some of these models. 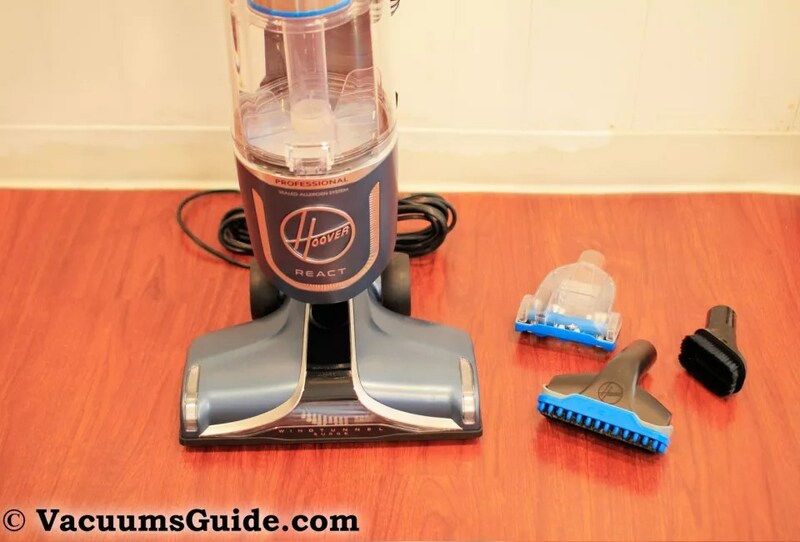 What’s your take on these new vacuum cleaners from Hoover?